Sometimes trips come together so well, that I almost weep with joy when I think about it. This is one of those trips.The bug hit me as I was sitting in the Victoria Theater in San Francisco for Reel Rock back in 2012. 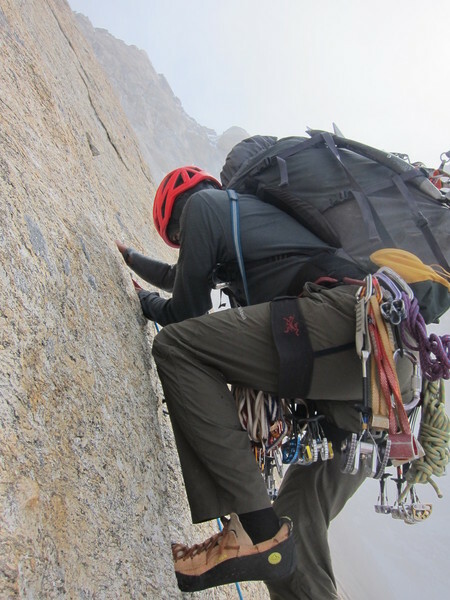 I was completely mesmerized…I was watching Conrad Anker, Jimmy Chin and Renan Ozturk climb Mt. Meru in India. My mind was set, I wanted to go somewhere far away and climb something that hadn’t been climbed. I hadn’t done an international expedition since my trip to China back in 2005. I was craving adventure. So, during the intermission of the film fest, I texted the most “available” climbing partner I know to casually gauge his interest in a trip like this. Jason (Spiceman) immediately texted back – he said was on board for some international climbing shenanigans…and we started scheming. We thought about going to Kyrgyzstan, Pakistan or China, but ended up deciding on the Miyar Valley in India’s Himachal Pradesh. Freddie Wilkinson had put a bug in my ear a few year back in Cuba, saying that the Miyar had loads of accessible, moderate routes just waiting to be climbed by a moderate guy like myself. Done. Luckily, Jason isn’t moderate. Sure, I am in decent shape, can carry a backpack, and am experienced at suffering…but I would need to bring a ropegun along to ensure success. We eventually added another “comrade” to our team, Sandeep. This was particularly awesome because Sandeep is an inherently funny guy and is also a rope gun. Not only that, but as you might guess he speaks Hindi (and not only the dirty words, like me). Sandeep also had a friend in Manali who could organize all the transport, base camp equipment, food, cooks and horsemen – and also help us navigate the confusing climbing permit process requirements in India. The Secret: Just don’t tell anyone! Our Steeley-Eyed RiCkShaW dRiVeR. We didn’t see him blink once in the heavy traffic. After a 3am arrival to New Delhi and a watching a morning monsoon storm from our shoddy guesthouse balcony in central Delhi, Jason and I jumped in a rickshaw taxi for a harrowing ride through New Delhi rush hour, our huge bags (full of heavy climbing gear) bulging from the three-wheeled-near-death-machine. 16 hours later we arrived in Manali, Himachal Pradesh – the jumping-off point for our three-week climbing expedition. Jason, at the “bus station” in Delhi…the bus eventually came a while later. We were quickly greeted by Sandeep’s friend Omi and his friendly entourage, and spent a couple days in Manali acclimating to the time zone and Indian culture before heading up to the hills. Sandeep arrived a day after us, with his parents in tow. Soon, Jason and I began to call his parents “Uncle” and “Antie”. It was a special treat to get to spend time with Sandeep’s family, and once our big van was packed up to take us 9 hours to the trailhead, his mom and dad jumped in with us to enjoy the ride to the trailhead! Jason, Sandeep and Sandeep’s mum – along with our unloaded van. Our first hurdle was to brave the monsoon-sodden roads, and cross the Rohtang Pass, a couple hours in a bus from Manali. I was never really frightened on the 25 mike drive to the pass, but I was intoxicated by watching the road unfold in front of us. The higher we drove, the hairpins got tighter, the road muddier, the sides of the road became nearly overhung. Then the mud gets deeper, goopier. The mud is the consistency of a Wendy’s frosty, the color of chocolate milk – perfect for mud wrestling. Our van driver Sano repeatedly takes us inches from a precipitous cliff, or passing within a whisper of large trucks as oncoming traffic closes in. Part of it feels dangerous, part of it seems like a symphony. Either way, it works…and I think that some of the uptight Seattle drivers could use some of this traffic experience for a bit of perspective. In Udaipur, the last town before heading up the remote and sparesly-populated Miyar Valley, we paid homage to the local Hindu god in a hillside temple. I felt as though our souls were cleansed, and we were cleared to violate the mountains at will. Before we left Udaipur, we passed a shop with a large “Cold Beer” sign outside. I sighed to myself – no more beer for 3 or 4 weeks. At the last minute Sandeep convinced me to buy a couple packs of smokes. Jason, emerges from the temple ready to CrUsH! Eight hours after leaving Manali, we were finally driving up the Miyar River Valley, hoping to make our way to the trailhead that night. Entering Miyar Canyon from the town of Udaipur, you would never imagine there is a vast wide valley above. Canyon walls are steep and tight. The road is in-cut into the cliffs in some places. The fact that there is a road here at all, is rather amazing in itself. Our progress up the Miyar Valley was halted by a stream overflowing at a road crossing. The heavy rains had brought down large rocks onto the “roadway”, and the stream was flowing fast enough that we decided to wait till morning, when there was less water flowing, to cross. Well, after much shenanigans and deal-making by Sandeep, we eventually found our way across the side-stream with the rest of our gear, and started up the Miyar Valley on foot, following eight horses carrying provisions for a month in the mountains. As we hiked up-valley for the nest three days, the shepherds and flocks were making their way downhill, on their way to lower climes (Punjab or lower Himachal Pradesh) for the winter. Huge herds of sheep filed around us like air over an airfoil. We hiked for two days, up-valley, through open, huge expanses – with nothing barring our advance besides the occasional rock fence to find our way through. A guy can get lonely up in the mountains for a month. Don’t judge! On our second day hiking up the Miyar Valley, the side valleys started to reveal glaciers a few thousand feet higher up – we could start to see big mountains up these drainages but the clouds kept their true appearance a mystery. Still, seeing high peaks above us got us excited to start climbing! We probably started walking faster without knowing it. Four days after leaving Manali, we found ourselves at what we call “base camp”…a spot in a meadow, not far from the termini of the Miyar, Takdung, and Chuudong Glaciers. Our little tent city was a relaxing place to call home for three weeks. A fresh spring nearby provided clean water, and the flat land around was perfect for throwing the frisbee. Base Camp views weren’t bad! Our cooks, Jogu and Sanu, held down the fort for us while we were higher up in the mountains. And, while we were in base camp they provided us with TONS of delicious Indian food to recharge our batteries. The kitchen tent, with our cooks Jugu and Sanu. After our long journey from Seattle to base camp, we were ecstatic to find ourselves at the base of the peaks we had been looking at for months – from photos taken from previous expeditions we found on the Internet and in the American Alpine Journal. We had read about these peaks several times – but to actually see them in person – it was very inspiring. Our first couple days at base camp we spent trying to acclimatize to the altitude. 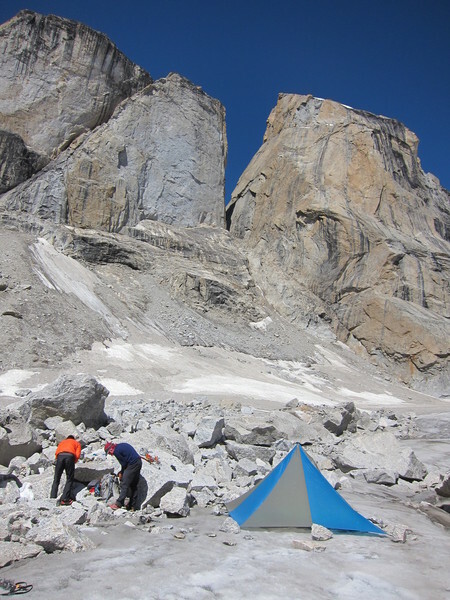 Base camp was at about 13,000′ above sea level – the peaks we hoped to climb were around 19,000′-20,000′. So, we had a lot of elevation to gain to attain our summits. With the help of some 2000-3000′ high acclimatization hikes, and a little boost from Diamox, we decided to head up the Takdung Glacier three days after arriving at base camp. We packed up with full alpine climbing gear and enough provisions for 6-7 days. Our packs were heavy! Our sights were set on 4 or 5 prominent peaks up a side-valley of the Miyar – the Takdung. We hoped that at least one of these unclimbed peaks would provide a reasonable, yet technical and enjoyable, route to its summit. We were hoping for 5.10 rock climbing and fun snow/ice climbing. All we could do was hope. And start hiking. The hike up the Takdung was, frankly, a bit brutal. We were hiking in a large boulder field for miles. Our speed was tortoise-like. Carrying a huge pack, while hopping from one loose rock to another, while not fully acclimatized to the altitude proved to be a challenge. We took a ton of breaks, often times supporting our heads on an adjacent boulder to help us from passing out! BUT… we continued up, up, up. Up and down, actually. The glacial moraines were anything but straightforward, and we did a lot of zig-zagging, back-and-forth, up and down the loose boulders that lay atop the miles-long sheet of ice that is the Takdung Glacier. By 5pm, we were exhausted after 9 hours of toil, and decided to stop for the night – at a rather grim spot that I called “Camp Drear”. The setting was unsettling. Wet gravel provided a soggy base for our tent, the clouds provided us with short bursts of graupel every 15-20 minutes, and the glacier provided water that was silty grey. Camp Drear! It wasn’t that bad, really. But perhaps more of a downer was the appearance of the mountains surrounding us. The quality of the rock looked loose and crumbly, and basically unclimbable. The glaciers, that provided access to the peaks called “The Ogres”(which we hoped to climb) looked melted out, steep, and the lower slopes were constantly peppered with rockfall and avalanches from above. Thankfully, as we continued up the glacial valley on the second day, the appearance of the mountains, and consequently, our attitudes, improved. We climbed through, and eventually above, a large icefall on the Takdung Glacier, and we found ourselves on clean ice glacier terrain – MUCH easier terrain to travel than the boulder hopping hell we had to endure on the lower glacier. We eventually found a reasonable spot to camp on the upper Takdung Glacier at around 17,000′ elevation. When we arrived at camp, we were each at various stages of hypoxia, fatigue and cheerfulness (grumpiness). We quickly got the megamid tent set up, hunkered down for the night, and discussed our options for climbing an unclimbed tower that lay to the east of us, across the width of the glacier. Oh Boy! Sanjana Peak is in the middle of this photo. The next morning, Jason and I packed up the ropes and climbing gear and made the two-hour walk across the glacier to scope out possible routes up the unclimbed peak. We saw what looked to be a decent, steep, crack system leading from the base of the peak to slightly easier terrain above. We roped up, and Jason led off, up the virgin crack. He led a wonderful pitch of 5.10b-ish climbing a full 70 meter rope length above the glacier. This is what I brought the rope gun for! Very happy with the quality of the rock, and our prospects for climbing the mountain the next day, we let out a loud series of signature crow calls, yelps, yee-haws, yah-hoos and other esoteric phrases from the base of the mountain. Sandeep could hear us a mile below at camp. We left the ropes anchored to the mountain that night, to give us a jump start the next day – then hiked back to camp. That night we went to bed with high spirits, and with a plan to start climbing the mountain as soon as the sun hit it – around 8:30am. I guess we should have started earlier. The next day, everything started well enough…we re-climbed the first pitch of rock as quickly as we could, then started swapping leads up the mountain. Sandeep led the second pitch up a nice line of cracks and face holds. 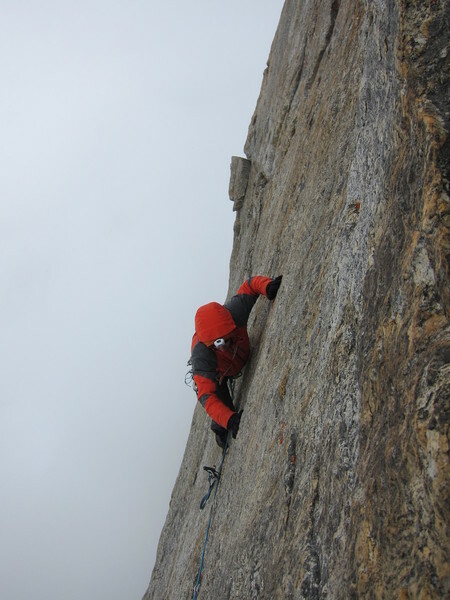 I led a long, but fairly easy pitch of ridge climbing, with a cool, airy, hand traverse over a “whales-back” feature. Definitely airy, and I was euphoric with where I was finding myself. We were all in a pretty good mood. We were making progress, and the sun was shining on us – at that point. A few more pitches up, we were getting higher and higher on the mountain, and started to encounter snow and ice, which slowed us down a bit. It was also starting to get later in the afternoon. I started to think about the prospect of having to descend (rappel) in the dark…not the greatest scenario, but not as bad as sleeping on the summit. I was still hoping it wouldn’t come to that. As usual, the clouds threatened in the afternoon. This day, we were lucky. The terrain was snowy, and it was cold enough to warrant boots in lieu of rock shoes. I was also mega-paranoid of the frostbite my toes had endured on Mt. Waddington, and I didn’t want a repeat of that episode. I led one final pitch in my rock shoes, half of which consisted of kick-stepping into 40-degree snow-on-slab. My feet were freezing by the time I arrived at the belay, and I changed into new socks, boots, and chemical foot warmers. Ahhhhh. It was getting darker by the minute now, and we kept making progress upwards…but we couldn’t yet see the actual summit – just more walls above us. We Have To Be Getting Close, Right?!?? Darkness still creeping in, Jason led a pitch of iced-up 5.9 cracks in his rock shoes, leaving slings for Sandeep and I to follow on aid in our boots. It was a great lead – and it took us to the base of what seemed to be the summit pyramid. I led a traversey pitch in boots that required a tender foot on loose rock, a bit of aid, and some very trusting moves across large blocks to what HAD to be the base of the summit pyramid. By the time I had a secure anchor set up, it was pretty much dark. I put on my down jacket. I was already wearing all of my clothes that I had packed. Following on aid in climbing boots. Donning his headlamp, Sandeep led up a short pitch if iced-up cracks to a huge block. I heard a declaration of “the summit” from below, and was relieved to be at our high point. The wind was starting to pick up, and I REALLY didn’t want to spend the night in the open, on the summit, at 19,500′. I followed Sandeep and Jason up to the summit via more aided climbing, and we had a pow-wow. It was about 9pm. After some initial disagreements, we decided it would be best to stick out the night on the summit, and take our time to safely decend in the early morning light. Being a fairly hyper guy, who also gets cold easily, I’m not sure how I made it through the night without losing my mind. For 9 hours, we huddled on that summit, most of the time crouched behind a huge boulder that was a windblock. But, I got cold sitting still, so I would get up every 30 minutes or so and take off my boots and warm up my tender toes with my hands. Then, I would bang my headache-drenched head against a rock to alleviate the pain – which was made worse by being tormented by watching Sandeep actually SLEEPING, just a meter from my feet. Jason seemed to fade in and out of sleep through the night, occasionally appearing conscious and mumbling something incoherent. As the night wore on, and the moon began to rise, I saw a terrible sight. Above us, looming like Mt Doom, was another tower. A tower that looked steep and formidable. I laughed an evil laugh to myself. We were not on the summit after all! And it pained me to think we had more climbing to do before we could descend in the morning. Hours passed, eventually, somehow…And by 5:30am, we roused each other into a light level of consciousness – we were all very tired and a bit delusional, BUT we wanted to climb to the summit before leaving this mountain. Jason tied in and led a snow pitch to the base of the ACTUAL summit pyramid. To get to the summit, one more rock climbing pitch was required – Sandeep deftly led this pitch on aid, and I belayed him while being about 7/8 asleep. Jason looked on with one eye open, one closed. Eventually, Sandeep yells “belay off”, and Jason and I head off to tag the summit around 9am. We Got This! The final final final climb to the summit! Three tired comrades atop Sanjana Peak. We decided to name the peak Sanjana Peak, after Sandeep’s late sister. The Cascade Route, goes around Grade IV, 14 pitches, 5.10b, A1. We were all extremely exhausted, but we began the descent with the first of nine 70-meter rappels that would take us down to the Takdung Glacier. We had one stuck rope(my fault) and I prusik-climbed up nearly the full 70 meters to fix the situation. I was completely exhausted after that, and I won’t make that type of rope mistake again. By 4pm, we were back at camp – 34 hours after leaving. We didnt say much to each other before crashing into out sleeping bags – we ate dinner, fell asleep, then woke up the next morning and hiked 8 hours down the boulder field, and back to the paradise of base camp. We ate heavily for the next three days, gorging ourselves on Jogu’s cooking. Dal, curries, chapatti, chai, coffee, custard. We ate and ate and ate. On our first rest day, I celebrated my 40th birthday. I am not one to place a lot of importance on birthdays, but I have to say that being on an expedition and climbing new mountains with friends is a pretty awesome way to spend it. Our cook, Jogu, was kind enough to make a wonderful cake with chocolate frosting, using just a kerosene stove. My 4oth Birthday present from Jason. Gummy Bears, whiskey, jerky and an FA – not a bad birthday at all! We still had about 9 days left in the Miyar, so we headed up the Takdung one more time to tackle a couple more peaks we had our eyes on. The weather had become quite fickle, and every day an afternoon cold front would move in and it would start to snow on us. With the bad weather hounding us, we opted to try a less technical peak this time. A snowy peak at the end of the Takdung looked appealing, and we set off to claim the prize of its summit. After a long day of glacier hiking, gully scrambling and boot-kicking, we dug out a little snow pit to hunker down for the night. Immediately, it began to snow, and at 5pm we were zipped in our bivy sacks for the night. We were all starving, but couldn’t bear sitting out in the cold and blowing snow to cook our food. A fitful night brought a beautiful, sunny morning. The sun slowly warmed our frozen boots and bodies. Lulled into complacency, we stalled getting out of camp and didn’t head up the steep snow of the peak until 9am. By 9:15, snow had started to fall, and it was COLD. My tender toes really hurt and I screamed in pain as we progressed up the 19,500-foot mountain at the head of the Takdung. Luckily, Jason was feeling great, and he led about 4-5 pitches of steep snow to the base of the summit. A quick scramble on compact rock brought us to the top if the peak, which we named Mt. Sealth – the name of the Duwamish Chief who worked with Doc Maynard to accommodate white settlers in the 1850’s. Cold, tired, and a bit frustrated with the fickle weather, we started rappelling down the mountain. 2-3 hours, and 9-10 rappels later, we were back on the Takdung Glacier. We were all exhausted the next day, and we decided to head down to base camp, leaving the splendor of the upper Takdung behind us. We were almost out of food, and the graupel-y weather had broken our spirits a bit. But, we also felt like our time on the Takdung was a success, and we headed back to base camp with our heads held high. Another long day of boulder hopping with heavy packs brought us down to base camp, and the comforts that go along with it – food, frisbee, warm weather. The last full day at base camp, Jason and Sandeep were still stoked. They headed out at first light and climbed a new rock route right above camp on a feature called David 62 Nose. Climbing on solid granite, they reached the summit just as the daily dose of graupel was being deposited on them from the heavens. 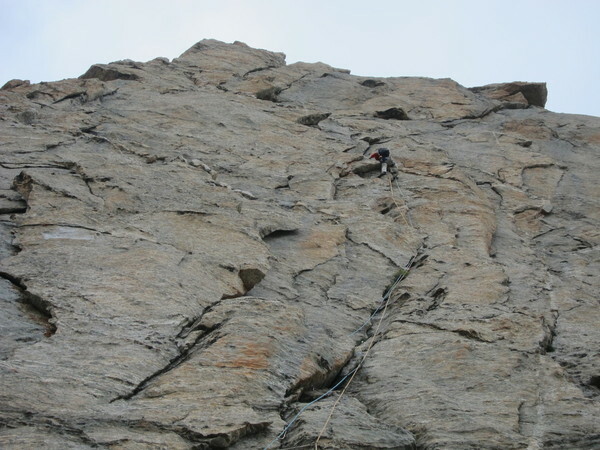 They called their 7 pitch, 350m climb the Emerson-Owen Route, with difficulties to 5.10a. The route took them most of the day, but it was a high-quality ascent – and it was another first ascent! Way to go guys! David 62 Nose, from base camp. Jason, on the lower section of D62N. Higher up on David 62 Nose. And, so quickly it was over! The next day, the horsemen arrived with five strong beasts, and we hiked back down valley to the roads-end in a long single day push. Before we knew it, we were drinking whiskey and eating chicken under electric lights. Another day of driving, and we were back in Manali, with wifi access at our fingertips. That night Sandeep was off in a taxi to Haryana, soon after Jason was off on a cramped bus to Leh, and I bought an Enfield Bullet. The climbing trip was over, but it couldn’t have gone much better. Two new peaks, three new routes, a great cultural experience – and great times with comrades. Near perfection. Myself with our adopted dog “Scrambles”. The whole kit. We used everything except the #5 and picket. Food from Trader Joe’s was very handy. Maggi noodles get old when you have them for breakfast and dinner 5 days in a row. 1 day airplane travel, 20 hours road travel, 4 days on foot. Whatever you’re into, be into it.